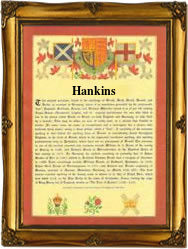 This interesting name recorded in various spellings including Hank, Hanks, Hankes, and the diminutives Hankin, Hinkin and Hinkins, has two possible origins. The very earliest recordings from the eleventh to the fourteenth century derive from 'anki' - a Norse-Viking personal name probably introduced in the 8th century and meaning 'the son of arn', as in Hank of Oxford in 1280, in the reign of Edward 1 (1272-1307). However, it is generally the case that most name holders have a 'Flemish weaver' origin, with 'Hank' being a Flemish nickname for John as in Ralph Hanks of Gloucester in 1642, without a full genealogical survey there is no sure way of telling which is the origin. In most cases the plural form is a patronymic meaning 'the son of Hank'. Early recordings include Alexander Henekyng in the 1273 rolls of Somerset, Known as Kirby's Quest, and Thomas Hankin, who married Rebecca Hillier at St Georges church, Hanover Square, London, in 1782. The first recorded spelling of the family name is shown to be that of Anke de Ankinton, which was dated 1194, in the Lincolnshire Pipe Rolls, during the reign of King Richard 1st, known as 'The Lionheart', 1189 - 1199. Surnames became necessary when governments introduced personal taxation. In England this was known as Poll Tax. Throughout the centuries, surnames in every country have continued to "develop" often leading to astonishing variants of the original spelling.